Offers a wide range of cardiac and respiratory services on an inpatient and outpatient basis including: echocardiograms, EKGs, complete pulmonary function studies (including spirometry, lung volumes and DLCO), arterial and venous dopplers, 24 hour holter, 30 day cardiac event monitoring. 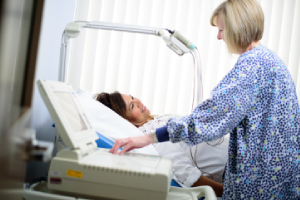 The professional staff consists of respiratory therapists and registered cardiac sonographers. Consulting specialists for peripheral vascular services also see patients in this location. To schedule an appointment or if you have questions please call 989-291-6335. Community education seminars and workshops are generally provided free of charge throughout the year on a variety of health-related topics. Physicians and other SCH healthcare professionals discuss the latest research and advances in treatments. Outside facilitators are also invited to talk about such things as stress management, massage therapy, gardening, etc. Free and low-cost health screenings at the Family Health Fair. 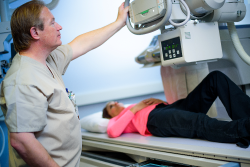 The diagnostic imaging department provides diagnostic radiographic examinations, as well as high-resolution real-time ultrasound examinations, digital mammograms, CT scanning (64-Slice), and bone density testing. SCH is staffed with ARRT-registered technologists with a board-certified radiologist on-site five days a week, for coverage 24 hours, 7 days a week through the department's teleradiology service. To schedule an appointment or if you have questions please call 989-291-6336. Our diagnostic imaging department offers testing through the use of a 64-slice Toshiba CT scanner. This state-of-the-art scanner can quickly scan any region of the body. It is designed to offer physicians greater diagnostic capabilities by helping patients to avoid more invasive medical procedures. This multi-slice technology captures precise images of the body’s rapidly moving organs like the heart and lungs. Multi-slice imaging is also useful for examining patients who are unable to hold their breath, like trauma victims, acutely ill patients and young children. For trauma patients, this may prove to be lifesaving technology due to the system’s ability to deliver precise images of bones, organs and internal bleeding. For patients with blood clots, infections, and diseases like cancer, early diagnosis may result in faster treatment. This service is available 24/7 and the staff can generally get you in within 48 hours of referral. PACS allows images of x-ray, ultrasound, mammography, and CT to be stored electronically and viewed on computer monitors. This digital imaging allows for faster delivery and higher quality of medical images, more flexible viewing with the ability to manipulate images on screen, instant access to previous images and patient records. SCH physicians can view images from multiple computers around the hospital or in their office. SCH's Mammography unit is ACR accredited. Patient comfort and convenience are emphasized by our professional female staff who will make you feel right at home. A complimentary gift of chocolates is provided compliment of our hospital's volunteers. 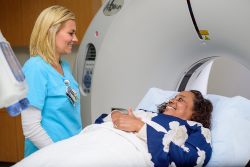 Our diagnostic imaging department offers services like venous doppler, carotid ultrasound and OB exams. 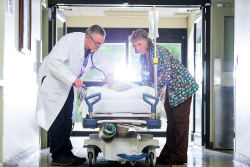 Staffed and equipped to provide emergency care 24/7 with a physician on duty at all times. All professional emergency department staff members are ACLS and PALS certified with advanced training in trauma care. Emergency radio communications are established with Montcalm County Ambulance and EMS personnel. Emergency transport by helicopter to other medical facilities for tertiary care will be arranged as necessary. Ancillary service support including lab services, CT scanning and x-rays are available at all times. Located within the hospital's emergency department, medical care is available for patients when their doctor's office is closed. No appointment is necessary; however, care is given based on severity of the patient’s medical condition. In other words, there may be a wait. Note: Charges are based on the nature and extent of the patient’s condition or injury and services provided. A fully accredited, modern facility that is proud to provide the highest quality of testing available. The laboratory serves the Sheridan community and the surrounding areas on a 24/7 schedule, accepting outpatient draws at all hours with the intention of serving our client base at their convenience. Medical directorship of the laboratory is overseen by a pathologist who is board certified in clinical and anatomic pathology. All laboratory testing is conducted by medical technologists/technicians fully degreed in the art of clinical sample analysis. Our capabilities include testing in the areas of general chemistry, immunochemistry, urinalysis, hematology, hemostasis, and blood banking. Walk-ins with lab orders are welcome 24/7 365 days a year. If you have any questions you may also contact our laboratory department by calling 989-291-6337. This 22-bed nursing unit provides homelike, personal care for the members of our community in need of inpatient services. 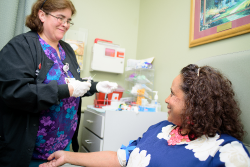 Our staff of registered nurses and nursing assistants work in partnership with physicians and multiple other departments to provide for a complete continuum of patient care. Family and friends are encouraged to visit during regular visiting hours from 11 am - 8 pm every day. Our professional staff provides comprehensive Physical and Occupational Therapy services for people of all ages in a relaxed and friendly environment. They get to know their patients on a personal basis and can better understand and fulfill their individual needs. Our professional staff provide a wide range of services including: individualized treatment plans, evaluation and treatment for injury management, home exercise programs, and short-term hospital stays for rehabilitation needs. Physician referral is required. Having your rehabilitation services arranged through your doctor's office-to be provided at SCH, in place of traveling a greater distance- just makes good sense. To schedule an appointment or if you have questions please call 989-291-6214. 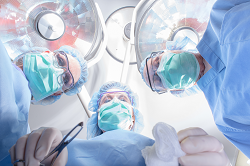 Our services are provided using board certified surgeons along with various physician specialists. We offer a complete continuum of patient care services to meet each patient's individual need: pre-admission services, same day or short stay surgeries, post-anesthesia care, and after-care phone check-ins. Our team of CRNAs, RNs, STs, FAs, and central supply personnel is dedicated to providing exceptional patient care services. SCH's nursing unit has 10-beds that have been licensed as skilled nursing beds as well as for medical and surgical care. The patient requirements are similar to those for a skilled nursing facility. Medical care is under the direction of our hospitalist in collaboration with physical and occupational therapy, a social services representative, and nutrition assessment services. For more information or questions regarding Subacute Short-Term Rehabilitation, please call 989-291-6290.